Tuesday night in DC was sweltering– 96 degrees with 80% humidity. To be honest, I find that my threshold for running in the heat is pretty high. It is much easier for me to adapt to the heat than to ignore the resentment that I would much rather be in bed. And I was totally okay with a slower run anyway. There were storm clouds on the horizon that concerned me, but I admit that I was too enchanted by the golden sunset behind the thin veil of a silvery thunderstorm not to run. I could see purple-white lightning cracking high in the sky but I didn’t get too nervous until there was a blinding flash of light almost right in front of my face that scared me to death and make me wonder, “Did I just see something get struck!? !” It was that bright. Terrified, I almost turned around and ran home until I saw a man pedaling toward me on a unicycle. He had a joyful smirk on his face, riding high at 8 feet tall on a unicycle in a thunderstorm, like he knew exactly what kind of spectacle he was and equally didn’t care. Having just been spooked by a lightning and with the golden atmosphere and rumble of thunder, it seemed slightly macabre and Wonderland-ish, but I thought if he felt safe riding an 8-foot unicycle in a thunderstorm, I could definitely keep running. About another 0.75 miles ahead, it started POURING. I turned around to run home. The feeling of rain on your hot skin while you’re running in such heat and humidity was incredible. I’ve never felt more refreshed. At the same time, the rain was pelting me in the face. 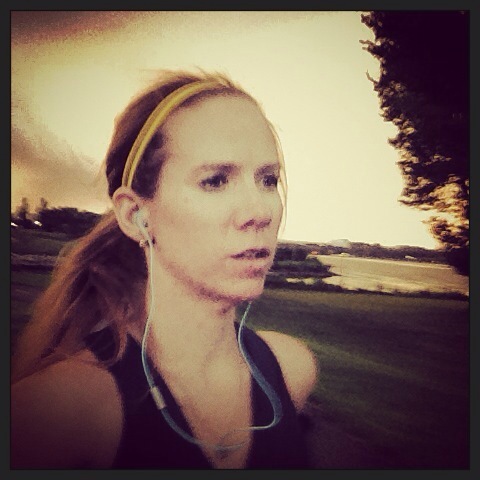 I pressed on, loving every minute of the run but praying I wouldn’t get struck by lightning. Running in severe weather is a rush, but I really do not endorse it. Still, it’s quite possible that it was completely worth the while. Running in the rain is good clean fun! Wednesday started out with another physical therapy appointment. Tuesday’s run was a little challenging– I didn’t mind that I went slow because of the heat and humidity, but it felt like someone was stabbing my calf muscle the whole time. I’m continually frustrated that this injury comes up again and again, even as I feel like I’m running strong; the next run could be slow and painful. My PT said my injury comes back because my hip and glute strength is not yet on the same level as my running. Honestly, this just made me that much more excited to enter the “off-season” phase and focus on strength-training and other cardio workouts. I admit it. I know my training has not been great this cycle— the injury messed things up more than the move did— and I am terrified that this marathon will be a disaster. I go back and forth with feeling like my sense of under-preparation is in my head or based in reality. 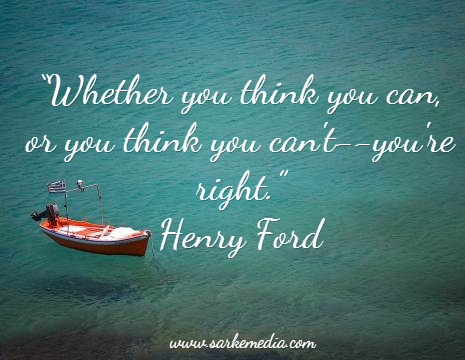 When I was a kid, my mom had that Henry Ford quote posted on our fridge (so grateful she did), and it took me forever to understand that how things go in my life is entirely up to me. I’m not talking about the design of my life– sometimes life just flat out doesn’t work out the way you want it to, but you do get the things that you need and things happen for a reason. Hard work has always been part of who I am in reaching my goals, but my mindset has not always been in the right place along the way and I’m learning a lot lately that it’s just as important in achieving what you want in life. Regardless of my training and the hurdles I’ve experienced along the way, I still took it seriously and I still got out there and ran when I could. I still believe that I can do this, and going into this race, that is all that matters. And then I booked my flight. At first, I was just scouting airline ticket prices to form a budget for my next pay period. I’d been looking for several days and was already starting to see prices tick upward into the low $300’s. After browsing a ticket sale through Southwest Airlines, creating some “test” itineraries, and realizing that I’d just come up with the most ideal travel itinerary (which for us locals is a cheap flight out of Reagan), I mindlessly entered my card number and pressed “confirm” on a flight itinerary. Immediately I thought, “OH MY GOD I HAVEN’T EVEN DECIDED IF THIS IS GOING TO HAPPEN YET!” What happened in that moment was all about snagging a good flight deal. And now I am committed. It was like I didn’t even think about my “trial” week. There is no option to defer anymore. There wasn’t just a random bib with a race number out there; I am expected to be on a flight in 35 days. I just booked a flight, and now it was going to happen. It just became real. Interestingly, underneath all of the panic, I didn’t feel like I had just made a huge mistake. I’d been committed to this all along anyways— all I was doing with this “trial week” was entertaining logical thought processes; the kind of thinking that sees a lot of blank spots on a training plan as proof that I can’t do this. In fact, I realized once I had calmed down that I had a reason to recommit to the next 37 days and focus not on having a PR or banner race, but finishing as strong as I possibly could at this stage in the game. I realized that now, this race is about never having given up. This isn’t over yet; my work here is not done. Pennsylvania Avenue to the WWII Memorial, around the Reflecting Pool, around the Lincoln Memorial, across the Potomac River to Arlington National Cemetery (mile 2-3), back across the Arlington Memorial Bridge, back around the Lincoln Memorial, around the Reflecting Pool, around the Constitutional Gardens (mile 4-5), down to the WWII Memorial, up the National Mall past the Washington Monument (mile 5), loop around at the U.S. Capitol Building, end at the Smithsonian Castle. Armed with that mindset, I set out for my evening run. Since the sun is setting earlier in the day now, I’m back to the routine of leaving work at 5:30 to go running. This evening was another hot one– 90 degrees– and I had a goal of running between 5 and 7 miles with the intent that I would focus on how I felt during the run and let myself stop if I needed it. During the run, I tried to focus on how I felt on a cardiovascular level. Most of my splits were between the 9:45-10:15 range, and it felt challenging for sure. This concerned me, given that I have a marathon in 36 days, but I realized I was running a little fast for such a hot evening. I came to a stop at 6 miles because I suddenly got nervous that I would be doing too much too soon. I’d already run about 11 miles and I still have another planned 5-miler plus a 12-mile run this weekend. I was also a mile away from where I started out, so I’d have to walk back to the office, which I figured would be a good additional cross-training. Post-run, I felt wrecked. My calf hurt and my hips ached. I know I won’t be able to run that fast in Chicago, but I did feel like I could have kept going if I was going at a much slower pace. Friday, I knew would have to be a rest or cross-training day. 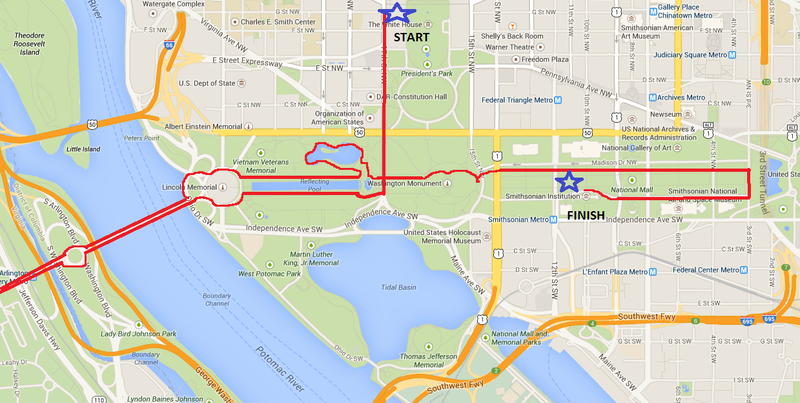 Running on the National Mall is my happy place run. Friday and Saturday were rest days for me. I didn’t necessarily plan this or even like it, really. I decided that a rest day was best anyways since I felt my injury starting to creep up after my Thursday run and I knew I had a long run ahead of me that weekend. I’d have preferred to cross-train, but since the pool at my apartment complex had closed for the season, I was floundering on cross-training options. Saturday, I woke up feeling a terrible stomachache and extreme exhaustion that left me couch-ridden all day. I knew exactly what the problem was and spent the day praying to God I wouldn’t end up with it on race day. I must have slept about five hours during the day in addition to the nearly 9.5 I had slept the night before. This wasn’t the worst thing– I was about to attempt my longest run in 6 weeks and I needed all the rest I could get, plus the day was a sweltering 98 degrees with severe storms later that night. Some days, you just need to cut your losses. On Sunday morning, the temperature had dropped into the high 60’s overnight and the air that was blowing on me through my open window was so cold I had to grab another blanket. It was absolutely perfect long run weather, especially compared to the day before. It was so cool, in fact, that I pondered whether I would need arm-warmers as I sat on the couch leisurely carbing up with Golden Grahams and watching “How I Met Your Mother.” Around 10:30, I finally decided it was time to get my run done so I could lay around the house for the rest of the day when I got back. The mid-morning temps were in the mid-70’s with a high in the low 80’s for the day, so I knew it was going to be a perfect run. And man. It was a PERFECT run. Here’s the thing– if anything is going to burn me out of running marathons, it’s sure to be the long runs. Long runs are weekly days of reckoning: you are faced with pushing beyond your limits for several hours at a time. It can get ugly as you start to feel bored, hurt, or defeated. Maybe your pace isn’t as good as you think it should be. Maybe you’d rather be doing something else. Maybe a song comes on that reminds you of a bad time and you are suddenly digging up a bunch of unresolved issues. Or maybe your mental game is just not there and you’re feeling like this is some sort of a chore. The weekly long run is what makes or breaks a marathoner, and it’s my biggest trap. Today, however, was quite the exception. I had a list of primary, secondary, and tertiary goals for this run. Primary goal: run at least 10 miles. Secondary goal: run 12 miles. Tertiary goals: run 14 miles. I wanted to run what I felt I could run. And I wanted to run all my miles without stopping or walking and I wanted to run as consistent of a pace as I could run, even if that meant 11:00. I was going for a consistent pace that I could potentially hold throughout the marathon. 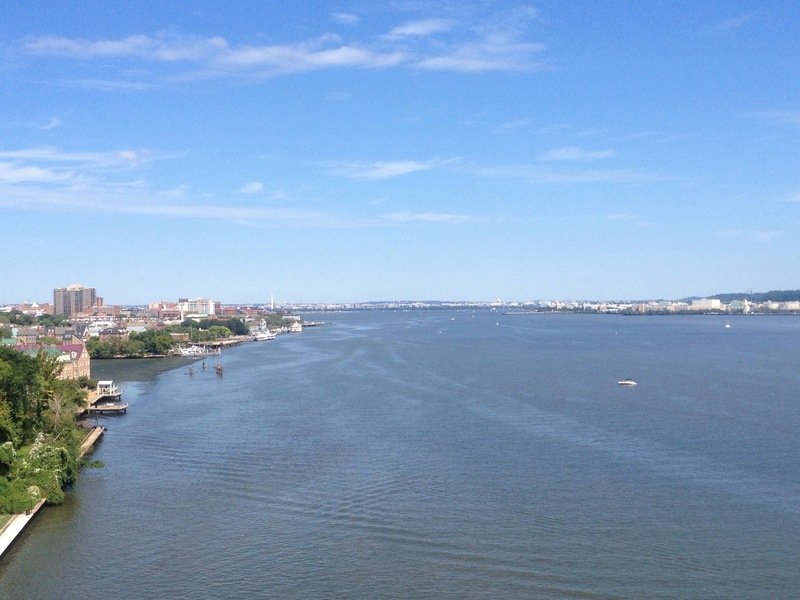 Virginia on the left, DC straight ahead, Maryland to the right. For this long run, I chose to head south on the Mount Vernon Trail into Alexandria, which is relatively new territory for me. The first three miles flew by. I felt happy, I felt strong. My running reflected that. I tried not to look at my Garmin and just run what I felt but I wanted to keep my pace consistent to avoid going out too fast, so I had to peek a couple of times. Doing so was a challenge– I tend to get hung up on pace, so the number I saw on my Garmin had the potential to discourage me or encourage me to run faster which would then cause me to burn up precious energy. The trail was also VERY crowded with bikers and running groups, but I kept my pace steady. The second three miles, I got into some city and business parks that are not good for long runs. I started to feel a little annoyed with myself that I had chosen a path so unfamiliar to me because I am trying to practice my mental plan for Chicago, which is to just zone out and run how I feel regardless of pace, and now I had to quickly think about where else I could run if it turned out that I needed to “buy” some mileage on another trail if I had to turn around a couple of miles before my out-and-back point was reached. The trail ended and I soon found myself running along the streets of Old Town Alexandria which, on a perfect weather Sunday afternoon in late summer, was packed to the teeth with shoppers and brunch-goers. I stayed focused on a runner far ahead of me (who was running in a manner that I assumed was also a long run) and trying to feed off of the dedication I’m sure he had in his own run, and soon I found myself back on the Mount Vernon Trail with its trusted paved path divided by a yellow line as far as I could see— this was what I needed most for a long run. I was around my fifth mile at this point, though I hadn’t looked at my Garmin watch in what felt like an hour. 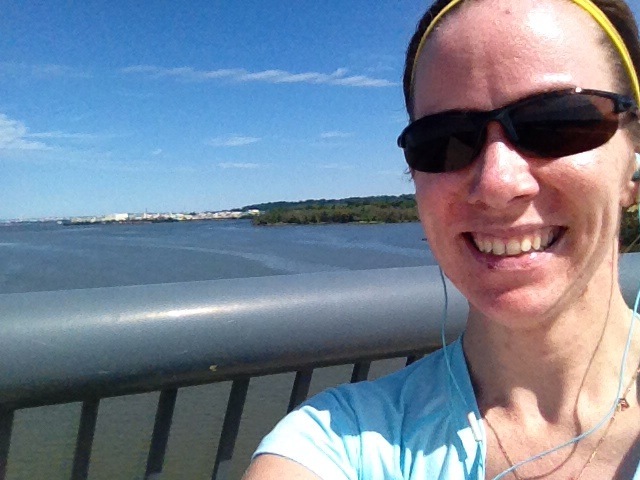 At mile six, the third set of three miles, I was about to start crossing over the Woodrow Wilson Memorial Bridge, which I had never run across before. This bridge is HUGE. It was windy and the view of Virginia on the left, Maryland on the right, and DC straight ahead was magnificent. It was hard to be anything but joyful, knowing that a year ago at that moment, I was packing up my life in DC to move back to Nebraska for what turned out to be the wrong job and the wrong place for me, and here I was, back in my town on a weekend long run as if the fires that I had just gone through had absolutely no impact on me. I could have never known that last year, and now I was back where I belonged– I was strong enough to handle anything now. I sucked down a chocolate Gu and decided I felt great enough to try for a 14-miler, plus I had barely crossed half the bridge despite already having gone a mile on it. I turned around at 7 miles. The next three miles, I was churning out 10:20 splits like they were easy. I found this surprising because sometimes the turn-around on an out-and-back long run is where I start drifting to the dark side of “isn’t this damn run over yet? ?” But somehow, I kept my head in the game and focused on running. I didn’t go over to the dark side, I barely thought my usual mind trick motivators of “only 5 miles left, I’m more than halfway through, I’ve got less than __ to go.” I literally just ran. Once I got to 10 miles, I knew I was meant to keep running. And then the eleventh mile came. And then when I heard my Garmin tick another mile, I knew I had what it took to keep going. And so I did. This split was harder than the rest and I had to dig a little for this mile. I didn’t believe that I had a 14th mile in me, not at the pace I was running, so I ran faster this last mile than any other mile. When my watch hit mile 13, I knew I was done. And I was in disbelief that I had just finished a textbook long run. A textbook run. If Chicago is anything like that run, I have absolutely nothing to worry about. Finishing this run, there was no tears of joy. No overwhelming emotions, really. I didn’t even feel like a total freaking badass. It felt like checking something off a to-do list that I was committed to completing. It didn’t mean I wasn’t proud of myself. It didn’t mean I finally felt like I had what it took. It felt like I was honoring a commitment I had made to myself; like all of this big talk of “I’m going to finish the Chicago Marathon,” was cheap and I was at the “you need to prove it” phase, and so getting out there to run this perfect run was doing just that in the most calm, cool, and collected way, like “I told you I’ve got this.” It felt like I was taking responsibility for the goal I had set for myself. I never believed I couldn’t do the race; even if I’d had the worst run imaginable– like last weekend’s disastrous 10-miler– I would still believe I could finish Chicago. This run reinforced to me that, despite everything that went on in the previous 6 weeks of training, I was still worthy to run the marathon. And now it is time to put that run behind me and look forward. I will be running 16 miles this coming weekend, but in between that, I will have 3-4 more days of running, a cross-training day, a day of rest, and a physical therapy appointment. But the hardest part will be in preserving the mentality that got me through that 13-miler. No unrealistic expectations, just running. No excuses, just running. No overthinking, just running. I have to realize that the way I am running now is where I am at as a runner and that, in 33 days, I have the privilege to run my fifth marathon as the runner I am right now– not the runner I want to be or think I should be. That is reason enough to hold tight to this present state of mind. It’s fragile as hell– deep down, I’m fighting delusions of grandeur because I feel better about this past week of running than I have in MONTHS— but my goal for this race has not changed through every run, good or bad. It’s about relentless pursuit of the Chicago experience; about celebrating myself as a five-time marathoner with a major marathon. There will be a time when I can focus on developing the runner that I want to be, and if that runner comes out with a wild success in Chicago, it will only be because I stopped to embrace who I am today and with every run one at a time. Week eleven is in the books.